SmokingCrayolas' entry in the Video Association of Dallas' 11th Annual 24-Hour Video Race. Due to various circumstances, this year's team matched SmokingCrayolas' record low for attendance, not seen since For Her Guys Only. However, being a team of three - Todd, Niki, Nathan - was still large enough to place us in back in the familiar confines of the "Guerilla" category. Dialogue: "I don't know what do you think?" We were kinda non-plussed by the theme on the way to Denny's (dropping iHop was the 1st in a string of tradition breaks that included ditching Sonic for Five Guys and pizza for Lover's Eggroll!). I kept coming back to the environmentally conscious aspects of cannibalism - working title "Going Soylent Green" - but nobody else was on board. It wasn't 'till Niki suggested a yellow dot and blue dot falling in love that we all jumped on the same bandwagon and an hour or two later our script was complete. Work flow was odd, in that we didn't have to film anything. This left everybody pretty much working on separate computers until we were ready to start slapping parts together. Niki was in charge of setting up and photographing locations and props, being our Narrator, and recording the dialogue. Todd did a multitude of jobs including the final script polish, arranging and recording our music, and taking lead on piecing the elements together in iMovie. I got the job of composing our visuals/animation. Unfortunately, I've lost familiarity with After Effects so most of our "animation" plans fell by the wayside as the midnight deadline approached. I want to applaud Niki and Todd as MVPs this year. The two of them ran the music, sound effects, voice work and editing beautifully, putting together a complete package while I slaved away on visuals. By the time I started feeding them stills, they could just slip them into the appropriate place and trim where needed. While I had a few notes on when to flip images and how to cheat "special effects" in iMovie, the bulk of the final product's polish is on them. Mad props to 'em both. It's kinda scary how talented and multi-role most of our regular players are becoming considering most of us don't touch this stuff but once a year. Makes me excited for SmokingCrayolas' future. 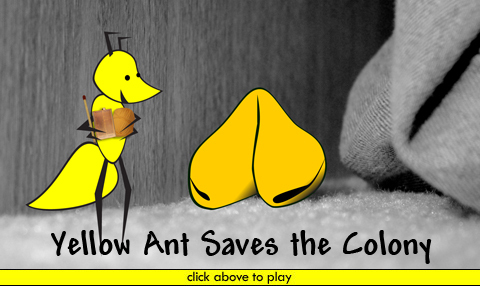 Update 05/14/12: "Yellow Ant Saves the Colony" took second place in the Guerrilla category!